Home » Service Manual Catalog » EPSON Service Manuals » InkJet Printers » SM_WF3540 I have paid for Reset Key but not received yet. Epson WF-3010, WF-3011, WF-3012, WF-3520, WF-3521, WF-3530, WF-3531, WF-3232, WF-3540, WF-3541 printers Service Manual New! 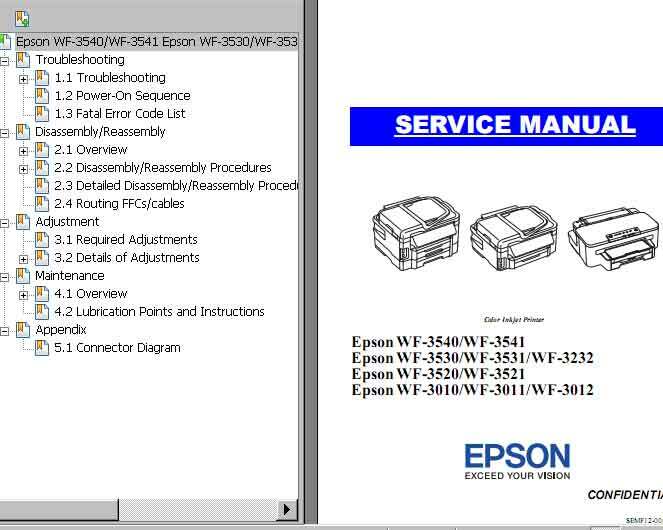 This Epson WF-3010, WF-3011, WF-3012, WF-3520, WF-3521, WF-3530, WF-3531, WF-3232, WF-3540, WF-3541 Service Manual describes basic functions, theory of electrical and mechanical operations, maintenance and repair procedures of the printer. Worked like a champ on my Epson Artisan 700. . Thanks! I have just bought an Epson printer TX111, only a month I have used it, the sensor scanner in the main board has broken, please tell me how to repair it bcoz I can\'t use both the printer n the scanner. And show me which one the sensor scanner, I just knew it from the service manual. Thank you for full manual! Notify me of updates to Epson WF-3010, WF-3011, WF-3012, WF-3520, WF-3521, WF-3530, WF-3531, WF-3232, WF-3540, WF-3541 printers Service Manual New!